Every month I subscribe to Vegetarian Times because I love to read through the articles and look at the recipes. However, I realized that I rarely try any of the recipes even though I keep all the magazines. I still have yet to try more recipes from the magazine, but out of the ones I have tried, this one has stuck with me for the past year! These tacos may seem ordinary, but the beans and roasted vegetables are what make them flavorful and amazing! I make these at least once a month and can’t get enough! For the RECIPE, head on over to Vegetarian Times website – Black Bean Tacos w/Roasted Peppers & Onions (gluten-free, vegan). I typically enjoy these tacos without cheese and sour cream and they are just as good because of the great tasting beans. So if you’re vegan or don’t prefer cheese, simply omit it from the recipe! I made these beans and they were sooooo delicious! I could eat these beans plain. We makes these in our house at least twice a month! These beans are great as a dip with just chips and in tacos or burritos. I do make a couple additions to the recipe. I add almost 1/4 cup of chopped fresh garlic, 1 jalapeno, 2T smoked cayenne pepper, and Cholula. Our house loves garlic and spice! Making these again tonight along with your cilantro rice! One of my favorites - I could eat these beans plain! 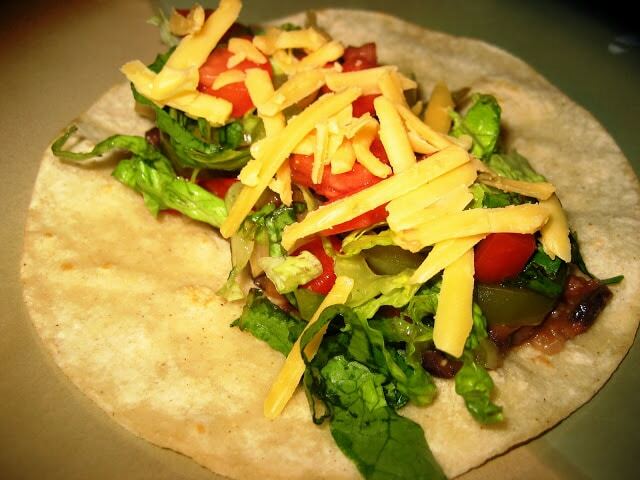 The beans and veggies in this dish are so flavorful that you definitely do not miss the cheese! =)Hope you like the cilantro rice!